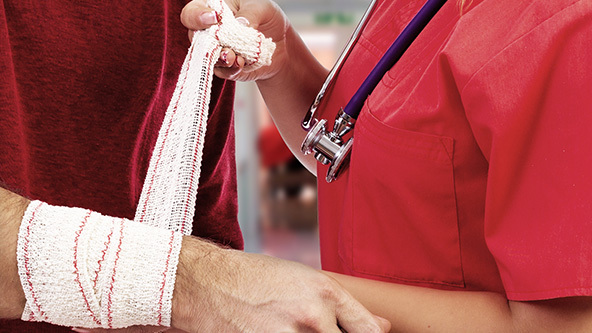 According to OSHA, American healthcare workers have one of the highest rates of job-related injuries and illnesses. This includes workers in settings like hospitals, clinics, dental offices, surgery centers, birthing centers, home healthcare settings, and nursing homes. The recent Ebola outbreak has refocused attention on physicians and nurses who may contract communicable diseases from patients. However, other healthcare workers also struggle with high injury and illness rates stemming from their work environments. For example, in 2010, orderlies, nursing aides, and attendants had the highest rates of musculoskeletal disorders of all occupations (249 per 10,000 workers), well above the national average (of just 34 per 10,000). While many other occupations have seen safety improvements in recent years, healthcare work has remained stubbornly dangerous. Between 1989 and 2011, the rate of American workers in all occupations suffering on-the-job injuries or illnesses fell from 8 per 100 employees to 3.75 per 100 employees. However, over this same time period, the rate for healthcare workers only saw a modest decrease (falling from 8.5 to 7.5 per 100 employees). There are a number of reasons why safety progress in healthcare has been such a challenge, but one is that the safety hazards come in such a wide variety of forms. We tend to think about healthcare professionals facing lab-based safety hazards, such as chemical and drug exposures, respiratory pathogens, and exposure to bloodborne hazards. However, they also face things like laser hazards, radiation and x-ray hazards, and injuries resulting from heavy lifting and repetitive tasks. OSHA even points out that healthcare workers can be physically attacked by patients. This high rate of workplace danger has powerful financial consequences, too. In 2011, U.S. hospitals recorded a staggering 58,860 work-related injuries and illnesses that were serious enough for an employee to miss work. And the total amount nationally for workers compensation losses in the healthcare field is close to $2 billion! For more information about OSHA’s safety recommendations for healthcare workplaces, you can visit their Worker Safety in Hospitals page. To learn more about MSDSonline’s suite of on-demand workplace trainings, visit our online course library.